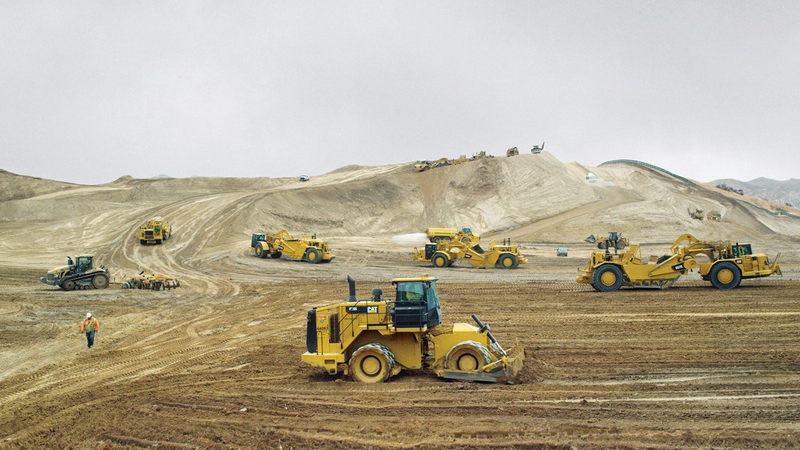 Highlighting the significant impact of mining and large-scale construction on the planet’s ecosystem, the latest film from documentarian Nikolaus Geyrhalter Earth is a powerful example of politically charged landscape filmmaking. A brief introduction underlines the extent to which mankind is now the most destructive force on the planet. Every year, 60 million tonnes of soil is moved by rivers, tectonic plates and other natural forces. However, thanks to advances in technology humans now shift 156 million tonnes of soil a day! Opening in the San Fernando Valley, where men “move mountains for a living” Earth visits seven mines and construction sites across the globe to witness how humanity is irrevocably transforming the natural landscape. From a marble quarry in Carrara, Italy, where workers openly confess that the mountains have notably diminished in height, to an abandoned salt mine in Wolfenbüttel, Germany that is now used to store nuclear waste, Geyrhalter depicts a planet being systematically decimated. “Are there any limits in this world?” asks the foreman of a huge development site in California. Geyrhalter’s film not only suggests that there is a limit, but argues that mankind might have already surpassed it. Each location is rendered with formal rigor and breathtaking precision, but unlike the director’s previous nonfiction studies (Our Daily Bread, Homo Sapiens) where viewers are invited to sit back and let the wordless imagery wash over them, these tableaux are augmented by conversations with the workers.The result is a symphony of voices from across the globe that allows for the sort of controlled, analytical observation and discussion, often missing from conversations surrounding environmentalism. The variation in each of these interviews is minor, but significant and precise to their location, allowing the film to transcend its somewhat repetitive structure, and evolve into a radically open and invigorating commentary on climate change. A few of the workers Geyrhalter interviews share his concerns for the environment, although others are adamant that the work they do is essential to the advancement of humanity. Worse, there’s a handful that see their work as part of a long-standing battle between nature and humanity. “If all else fails, there’s always dynamite” guffaws one construction worker. These interviews dispense much-needed context to Geyrhalter’s monumental images, but words can only do so much. In lesser hands, the level of formalism on show could come across as disingenuous, even elitist, but unlike most advocacy documentaries, Earth works because its argument is fundamentally visual. These breathtaking images, many of them vast and awe-inspiring, highlight the magnitude of the issue at hand. At times, such as at the Gyöngyös coal mine in Hungary, they’re reminiscent of the haunting, post-apocalyptic spaces of Andrei Tarkovsky’s Zone, in others, they resemble an alien planet being terraformed for human habitation. A sentiment shared by one engineer working on the 55-kilometre-long Brenner Railway Tunnel “It’s like we’re astronauts going where no man has ever been before” he proudly proclaims whilst standing 5,200 feet below the base of the Eastern Alps. Individually each of these episodes feel like a purely formal experimentation, but as a whole they take on tangible emotional and political weight. Burrowing to the core of humanity’s unsustainable relationship with the planet Earth is both a rallying environmentalist documentary and a terrifying portrait of a rapidly vanishing landscape. The Berlin Film Festival runs from 7-17 February. Follow our coverage here.